Content marketing is big business for SMEs. Did you know that content marketing generates more than three times as many leads as outbound marketing, and costs 62% less? Content marketing is crucial for organisations who are looking to get more leads, boost sales and grow their business. 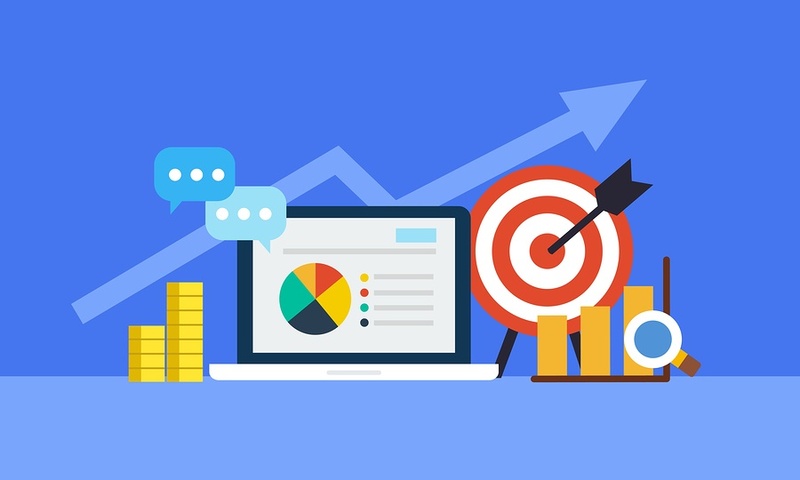 Whether you’ve already jumped on the content marketing bandwagon or you’re just starting out, it is never a bad idea to revisit your content strategy. The thing about content strategies is that they should be dynamic; they should change and grow as your business changes and grows. If you’ve never created a content strategy template or are looking to update your content strategy template, you’ve come to the right place. In this article, I will be showing you how to create a winning content strategy template that can easily be updated and grow with your organisation. The purpose of creating a content strategy template is to ensure your content is not only aligned with the buying process, but to also make sure your content is organised, published regularly and on time. Your content strategy template will help you align your content with not just the buying process but also with other events that may influence your content marketing like; trade shows, conferences, seasons, new product launches or industry research and reports. What Should a Content Strategy Template Look Like? Content strategies don’t need to look a certain way. In fact, content strategy templates take many different forms. For example, at The Inbound Marketing Company (TIMCo), our content strategy templates are created using Microsoft Excel. Excel spreadsheets are easy to use, and update as your company evolves and your content strategy changes. We then use a project management tool called Teamwork work to manage the tasks associated with publishing each piece of content. Your content strategy templates should include as many details as possible. Across the top row you should include dates depending on the detail you need you can include a day per column or a week. 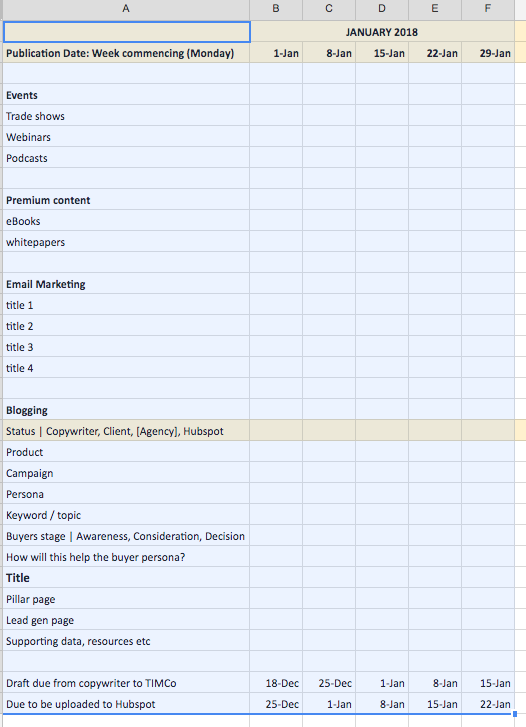 Down the side, the first column is all the detail that will influence what and when you publish content like: seasons, new product launches, conferences, blog topic, buyer persona, email, social media, due dates for draft, approval and publishing. Let’s take a look at some of the most important pieces of information every content strategy template should include. Content can and should come in all formats. Rather than writing new content for your blog, video, website and social media posts – repurpose your content. For example: an eBook can be repurposed into 2-4 blog articles, then each blog article can become 4-6 social media posts. A video can become a blog. Several blogs can become an ebook. Infographics, which make for great blogs or videos, are an interesting and visual way of sharing data. They help organise and visualise data in a way that is easier to digest than just words and numbers alone, helping people to better understand and remember key points. When it comes to videos, did you know that videos are 40x more likely to be shared on social media than other types of content? Recent research from HubSpot shows video is the most preferred form on content amongst modern buyers, so it is definitely worth adding this content format to your repertoire. A successful content strategy will take into consideration your buyer personas. Each piece of content you create should align with each stage of the buyers’ journey, answering questions they have at each stage and providing valuable, educational resources to help them move through the sales process. To ensure your content is aligned with the buyers’ journey, and that you publish helpful content that addresses all the questions your buyers have – include this information in your template. At TIMCo we do this by having a row in our template called “buyers’ journey” we then insert the words, ‘awareness’, ‘consideration’, or ‘decision’. Under each of these words we answer the question ‘How will this help the buyer?’ with insight from our persona development process. This mapping ensures our content has a purpose that is aligned with helping our buyers move through the sales process. There are many events that can influence your content. To ensure you don’t miss anything, write down everything that may influence your content to ensure its timely and relevant. Events like: seasons, featured days like Mother’s Day, new product launches, major sporting or music events that are relevant to your industry, trade shows and industry conferences are all examples of events that can influence your content and should be included in your template. Doing this allows you to align your content based on key events happening throughout the year. It’s also great for content inspiration. It’s equally important to include your lead generation campaigns and to be writing about those to boost your lead gen. These might be a new webinar series, and new offer that your promoting on your website or an ebook. How you promote these through content also needs to be included: blog, email and/or social media posts. To make sure you never miss a publishing deadline. We recommend working 2 weeks ahed of schedule. We aim to have draft copy ready for approval 2 weeks before publishing due date. Here are a couple of images to show you our content strategy template and how we manage our content publishing.